JUNE 2007 -- It’s June! Looking for a special way to spend a Sunday? 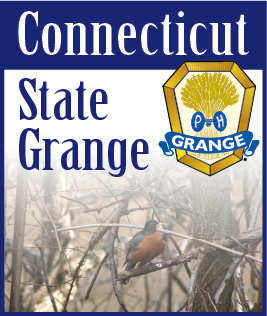 Why not attend Grange Sunday at Good Will Grange Hall in Glastonbury on Sunday, June 10th? The Service starts at 11:00 a.m. followed by a Lasagna Dinner served by the Youth. At 1:00 our Grangers get to show off their talents. We will be judging both the Talent Contest and the “A Number” Contest. I have seen some of these numbers already and it looks like we will have a really good contest this year. I am also looking forward to visiting with everyone that day. My thanks to everyone who sent cards after my recent hospitalization. If everything goes according to schedule I should be out of the cast for Grange Sunday. But, one way or another I plan to make those stairs at Good Will. See you then.